Aleutian Tern: A medium tern, with white forehead, black cap, bill, and legs, gray under and upperparts, white rump and tail. Undertail coverts, cheeks, and area below cap are white. Wing projects beyond tip of tail at rest. Strong direct flight with deep wing beats, often high above water. Arctic Tern: Medium, slim tern with gray upperparts, black cap, white rump and throat, and pale gray underparts. Tail is deeply forked and white with dark edges on outer feathers. Bill is dark red, rarely tipped with black. Legs and feet are red. Bouyant graceful flight with steady wing beats. Black Noddy: medium-sized tern, very dark brown-black with white cap, white (lower) half-eye ring, and long slender bill. The wedge shaped tail has small notch at tip. Black legs and feet. Strong, swift and fluttering flight. Typically flies close to the surface of the ocean. AKA White-capped Noddy. Black Tern: Small tern with black head, bill and underparts. Back, wings, and tail are silver-gray. Vent is white; legs and feet are dark red but may appear black. Bouyant direct flight with deep rapid wing beats, hovers for insects. Uneven foraging flight. Plunge dives on occasion. Black-footed Albatross: Large seabird with long wings, gray-black body, and white ring around face at base of bill. Uppertail coverts are pale gray. Most have dark undertail coverts, some have white undertail and belly. The most frequently sighted albatross off the Pacific Coast of North America. Black-legged Kittiwake: Medium-sized white gull with pale gray back and upperwings and black wing tips. Bill is yellow, legs and feet are black. Swift graceful flight, alternates several rapid shallow wing beats with a glide. Often hovers over water before diving for prey at surface. Black-vented Shearwater: Medium shearwater, brown-black upperparts, white underparts, brown mottling on sides of breast and flanks. Dark cap extends below eye. Tail is dark. Eats fish, crustaceans, and squid. Quick low flight with short stiff wingbeats followed by glide. Soars in high winds. Bonaparte's Gull: Medium gull with black head and bill, gray back and wings, white underparts and tail. White outer primaries with black trailing edges are visible in flight. Legs are red-orange. Catches fish by wading and diving. Light and direct flight with rapid wing beat, ternlike. 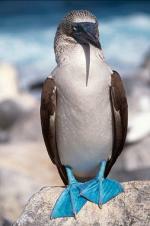 Brown Booby: Large, gull-like seabird, mostly dark brown with white underwing coverts, belly, and vent. Blue-gray bill. Yellow legs and feet. Plunge dives from 30-50 feet. Feeds on parrot fish, flatfish, mullets, halfbeaks and other fish. Alternates strong rapid wing beats with glides. Brown Noddy: Medium tern, brown except for white forehead blending to gray nape, and small white (lower) half-eye ring. Wedge shaped tail has small notch at tip. Black bill is long, slender. Black legs, feet. Strong, swift flight with steady wing beats. Often flies with erratic changes of direction. Buller’s Shearwater: Medium shearwater, gray upperparts, white underparts. Head has white face, black cap, black bill. Tail is black. Legs and feet are pink. Dark gray M-pattern is visible across upperwings and back in flight. Alternates deep steady wing beats with long glides. Soars in high winds. Bulwer's Petrel: Medium petrel, dark brown overall, pale diagonal bars across secondary coverts. Long tail is usually held in a point; wedge shape visible when fanned. Bill is black and hooked. Legs and feet are black. Feeds on squid, plankton and small fish. Picks food from surface while in flight. California Gull: Moderately large gull, white body, gray wings, black wing tips. Bill is yellow with red and black spot near tip of bill on lower mandible. Legs are yellow; eye is dark with red orbital ring. Strong direct flight with deep wing beats. Soars on thermals and updrafts. Caspian Tern: Large, stocky tern with pale gray upperparts, white underparts. Cap is black and may appear weakly crested; large bill is coral-red. Undersides of primaries are gray. Tail is white, relatively short, and slightly forked; legs are black. Hovers above water before diving. Common Tern: Medium tern, medium gray upperparts, pale gray underparts, glossy black cap and nape. Wings are dark-tipped and have dark leading edge on forewing. Red bill is black-tipped. Legs are red and tail is deeply forked and elongated. 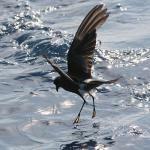 Direct flight, hovers above water before diving for prey. Cook's Petrel: Small petrel, slate-gray back and upperwings marked by a distinctive black M pattern. Underparts, underwings are white. Face is white with small, dark mask. Wings are long and slender. Tail is gray, black-tipped central feathers and white edges. Black bill, blue-gray legs and feet. Overview Dark-rumped Petrel: Medium petrel with dark slate-gray upperparts and white underparts. Sides of neck and underwing margins are dark. Bill is relatively short, black, and hooked. Legs and feet are pink-brown. Tail is white and wedge-shaped. Feeds on suqid, crustaceans, and fish. AKA Galapagos Petrel.